Magic Kingdom Live Entertainment and Parades: It’ s impossible to take in all the many live entertainment offerings at the Magic Kingdom in a single day. To experience both the attractions and the live entertainment, we recommend that you allocate at least two days to this park. In addition to parades, stage shows, and fireworks, check the daily entertainment schedule (Times Guide) or ask a cast member about concerts in Fantasyland, the Flag Retreat at Town Square, and the appearances of the various bands, singers, and street performers that roam the park daily. WDW live entertainment guru Steve Soares usually posts the Magic Kingdom’s performance schedule about a week in advance. Meeting Anna and Elsa at Princess Fairytale Hall: The hottest ticket in the Magic Kingdom is meeting Anna an Elsa of Arendelle. If you are able to get a FastPass+ reservation via MyDisneyExperience.com we recommend go for it as the standby lines are insane. Like celebrities their autograph is so desired that from the moment the ropes drop at the Magic Kingdom huge crowds launch towards Princess Fairytale Hall. Castle Forecourt Stage: The 20-minute Dream-Along with Mickey live show features Mickey, Minnie, Donald, Goofy, and a peck of princesses and other secondary characters, plus human backup dancers, in a show built around the premise that—quelle horreur!—Donald doesn’t believe in the power of dreams. Crisis is averted through a frenetic whirlwind of song and dance. Merida Meet and Greet at the Fairytale Garden: The garden, formerly the site of Storytime with Belle and the Tangled play and greet, is a small outdoor theater. It received a Scottish Highlands–inspired makeover and is now the home of Merida, the strong-willed heroine from Brave. The new setting has an area in which those waiting to meet Merida can get archery lessons and participate in other activities until it’s their turn to meet Merida. The activity targets the under-5 age group. 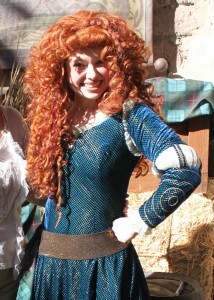 If you plan on meeting Merida, arrive at least 20–30 minutes early to the staging area. Once the area is at capacity (about 20 children and parents), cast members rope it off. Be forewarned that the entire experiencewill take a whole hour out of your day. The play and greet takes place six to eight times a day; check the daily entertainment schedule (Times Guide) for showtimes. 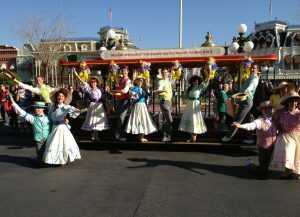 Parades: The afternoon parade is usually staged at 3 p.m., this parade features floats and marching Disney characters. A new afternoon parade is introduced every year or two. While some of the elements, such as the Disney characters, remain constant, the theme, music, and float design change. Seasonal parades round up the mix. 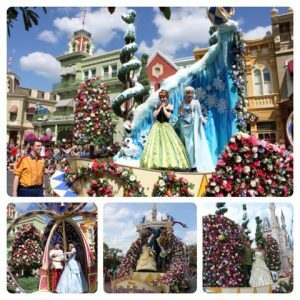 The new Disney Festival of Fantasy Parade includes new floats based on the stories of Frozen, The Little Mermaid, Sleeping Beauty, Dumbo, Pinocchio, Peter Pan, Tangled, and Brave. It features a brand-new original soundtrack with songs from Disney films in addition to a parade theme song. It is a good way to see the Frozen royals if you where not able to meet that at Princess Fairytale Hall. Evening parade performances vary by season, happening as often as twice a night during the busy times of year, to two or three times a week during the less busy seasons. We rate the evening parade as not to be missed. The Main Street Electrical Parade (MSEP) is the current nightly cavalcade at the Magic Kingdom. In our opinion, the Magic Kingdom’s nighttime parade is always the best in Walt Disney World, and the Electrical Parade is the standard against which everything else is judged. Disney is known to swap out parades (MSEP replaced SpectroMagic in 2010) and may do so at any time. If you’re at Disney World while MSEP is running, make a special trip to see it. 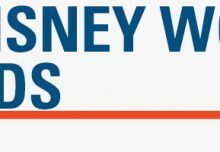 The Unofficial Guide to Walt Disney World with Kids would not be possible without the TouringPlans research team. Check out the website for more tools, tips and step-by-step TouringPlans that save you up to 4 hours of standing in line every day. 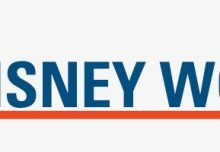 Discover the crowd calendar, the Disney World Discount Ticket Calculator and much more. Over 100,000 families subscribe to TouringPlans.com every year. You can join them HERE. I’ve travelled to WDW with just our family (2 adults 2 kids), a second time with grandparents, and a third time with grandparents and my sister’s family (2 adults 2 kids). The more people you have in your party, the harder it is to find dining opportunities together, the harder it is to find rides to ride together, and the impatience and difficulties start to wear on everyone. Keep the size of your party as small as possible for a relaxing time on your vacation. Indeed a large group puts additional stress on everybody. I have solved this by touring early AM maximum 5 attractions together. Let everybody do their own thing till late lunch together (2 pm) and again separate for the afternoon. Sometimes little groups formed such as the teenagers while parents with little kids & grandparents went back to the hotel for a break, pool or nap time. At night we would set out together again to watch the fireworks or the evening Main Street Electrical Parade. Have a magical week and thank you for your tip. – Plan down time! As amazing as the Disney World parks are, the pools are awesome, and the kids love the theming. Be sure to set aside some time for them to really enjoy the pool, especially when there are party like events scheduled. – Pack things like glow sticks and spray bottle fans purchased at home to hand out at parades or while waiting in line on a hot day. – Pack stacks of 2 quarters, 1 penny in a tube like from M&M mini’s. This way you have pennies & quarters ready for the stretched penny machines, which are wonderful and inexpensive souvenirs from all over the parks and resorts. – tour the parks “in order” – kids tire out much faster than adults so while jumping from Tomorrowland to Adventureland to Fantasyland to save wait time on the rides looks good on paper, trekking back & forth across the park several times can lead to a less than magical day. Those are great tips! Thank you so much. I love your suggestion to buy glow sticks and spray bottle fans home. Have a magical week! Wonderful! Thank you we appreciate our fans. Have a magical day! We love to take advantage of the free admission for kids under 3. We have done a Disney world trip with all of our children at age 2+. To make the most out of those first visits we spend months in what I like to call Disney boot camp at home; watching the animated classics to become familiar with the characters, watching the Disney vacation planning DVD, and even previewing some rides on YouTube. So far we’ve had wonderful first visits for all! Just before his 3rd birthday that was the first time I took my son to WDW. I still have the ‘ticket’ they issued for him. A paper ticket with his picture. Precious! Than you for your tip and for entering our giveaway. Good luck! We went right before our daughter turned 3 for our first trip. She was free for basically everything. Via Napoli even let her pick a kids meal for free. Make sure you schedule rest breaks for the middle of the day. Thank you for your tips. Very wise deception to take a brake in the middle of the day. Have a magical day! Thank you for your interest in our article on live entertainment at the Magic Kingdom. Unfortunately I do not have video. We are glad you enjoy our blog.